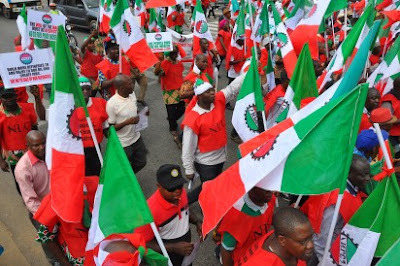 Nsuk Gist: Nigeria Labour Congress NLC suspends nationwide strike. Nigeria Labour Congress NLC suspends nationwide strike. NIGERIA Labour Congress, NLC, led by Mr. Ayuba Wabba, yesterday suspended its ongoing nationwide strike to force the Federal Government to reverse the N145 per litre pump price of petrol and resolved to resume negotiation with the government. This came as the Joe Ajaero led faction assured that labour would engage the federal government to ensure there was a time frame for ending importation of refined petroleum products into the country. Earlier, at an emergency meeting of the National Executive Council, NEC, in Abuja, to review the protest, Wabba noted that the NEC reviewed the protest and its impact across the nation, the sacrifices of its members, response of the generality of Nigerians, government’s attitude and alleged brutality of the police in some states. Briefing on the communiqué he signed alongside the General Secretary, Dr. Peter Ezo-Eson, he said NEC took special notice of the Ebonyi State Police Command, the factional President decried perceived intimidation, harassment, arrest and detention of members unjustly. According to him: “NEC after due consultation with its constituents resolved to suspend with immediate effect, the action it commenced on Wednesday, May 18, 2016. The action is hereby suspended. Congress will resume negotiations with government on the twin issues of the hike in electricity tariff and an increase in the pump price of petroleum products and any other issue that may arise thereof. It similarly remains committed to genuine dialogue within the framework of internationally established and recognized principles of representation. Wabba explained that the protest was informed by the twin issues of the unjustified and illegal hike in electricity tariff and increase in the pump price of petrol, declaring the protest to be a success in spite of both internal and external challenges. According to him, NEC also acknowledged that the temptation to compare the strike with that of 2012 could be compelling, but that the scenario had changed as both the actors and the terrain were different, stressing that before the action, it had anticipated a probable outcome and was not surprised by government’s negative response. The factional president said however, NLC felt fulfilled by having the presence of mind and courage to identify its mission and fulfilling it, stressing that if a similar situation arose again, it would still rise and stand with the people. He noted that NEC commended those who took part in the action in one way or the other and reaffirmed its commitment to the struggle, insisting that the action was taken in the best interest of the poor and the weak and in drawing government’s attention to the dangers of relying on importation of petroleum products as a sustainable strategy for making available petroleum products. He argued that in the days ahead, time would prove NLC’s position right, singling out for commendation, state councils, affiliates and other Nigerians who at very short notice joined the struggle. Wabba added that NEC equally commended the leadership of the National Assembly and All Progressives Congress, APC, led by Senator Ahmed Bola Tinubu. Meanwhile, the NLC faction led by Joe Ajaero, weekend, assured that organized labour would engage the Federal Government to ensure there was a time frame for ending importation of refined petroleum products into the country. At a briefing in Lagos over the agreement reached with government on the way forward following May 11 hike in the pump price of petrol to N145, the faction insisted that the N145 per litre of petrol remained illegal since it did not come from the Board of Petroleum Products Pricing and Regulatory Agency, PPPRA. According to Ajaero, even if Organised Labour and other Nigerians forced the government to reduce the price to even N50 per litre that would not make it legal. Ajaero assured that labour representatives in the 15 member technical committee expected to be inaugurated today with the Minister of Labour and Employment, Senator Chris Ngige as Chairman, would do their best to ensure Nigerian workers get the best possible. Contributing, Deputy President of the faction and President of Nigeria Union of Petroleum and Natural Gas Workers, NUPENG, said labour would do all that was possible to ensure there was a time frame to end importation of products into the country.